Every May 13 for the past 50 years, current and retired members of the LAPD, Marines, friends, family members and those who just want to pay their respects gather at Forest Lawn Memorial-Park in Hollywood Hills, just inside the entrance, on the lawn outside the Church of the Hills, at the grave of LAPD Officer Oscar Joel Bryant. They gather to pray and remember, to leave flowers and American and Marine flags in honor of a man who was killed in the line of duty on that date, in 1968, at the age of 26. Officer Bryant was working alone in a patrol car on the afternoon of Monday, May 13, 1968. His assignment that day was to assist other officers by taking reports. Shortly before 3:30 p.m., as he was taking a report on South Western Avenue, he heard a call on his radio of a robbery in progress at the Lelia Mae Dress Shop, at 6617 S. Western Ave. Bryant was less than a block away, so he raced to the dress shop. When Bryant arrived, he saw three men coming out of the shop. Bryant drew his gun, and ordered the men to stand on the sidewalk in front of the liquor store next to the dress shop, with their hands over their heads against the liquor store window. He called for the manager of the liquor store to come out, and asked her to call the police for back-up. One of the three men pulled a .38-caliber revolver from his waistband and fired from under his arm back at Bryant, hitting him in the leg. As Bryant returned fire, the man shot again, hitting the officer in the left side of his chest. Despite his injuries, Bryant emptied his revolver, hitting two of the men -- one in the chest, and the gunman, who was hit in the hand. Bryant died at the scene. After the shooting, about 50 officers arrived at the scene, with a police helicopter overhead, and quickly arrested one of the wounded men, one man still inside the shop, and two men sitting in two cars parked at the rear of the shop. Based on the information found inside the cars, including the purses of the two young women, and the assistance of witnesses who pointed out where the suspects fled, six suspects were in custody within 90 minutes, including the 25-year-old shooter. The seventh suspect was arrested several hours later. According to the police investigation, the primary target of the robbery was not money, but the dresses in the shop. The owner of the dress shop, Lelia Mae Sterling, said two young women came into her store at about 3:15 p.m. She asked if they needed any help, but they declined. Three men then entered the store, and Sterling said one of them pressed something against her back. "The man said, 'If you don't scream, you won't get hurt.' He pushed me to the back, and I could hear the girls going through the racks, pulling dresses off," Sterling said. "He tied my legs and arms, and asked me where was the key to the back door. I told him it was in the drawer." "The man told the others, 'Get busy, we got to get out of here.' To me, he said, 'Don't move, don't cry.' He put a rug over my face. Then I heard some shots and the glass breaking." Bryant was born Jan. 8, 1942, in Ohio. After serving in the Marines, he joined the LAPD on Oct. 26, 1964. After serving in the department's central traffic division and the jail division, Bryant was assigned to the University Division in late 1967, about seven months before the shooting. Bryant was survived by his mother, Mary Bradley, and a brother, Joseph Lee, of Indianapolis, Ind. At the time of his death, Bryant was engaged to be married. Of the seven people arrested after Bryant's murder, two teenage sisters were sentenced to a California Youth Authority facility, and four were convicted of first-degree armed robbery and sentenced to five years to life. The shooter was convicted of second-degree murder and first-degree armed robbery, and sentenced to 11 years to life. Aside from the two teenage sisters, the other five were all either on probation, parole or had been arrested within a year prior to Bryant's murder. Bryant's coffin was covered with an American flag that had covered the coffin of another Marine, John Stowers, who was killed in action in Vietnam, and buried in Portland, Ore., two months earlier. The flag was offered by Stowers' brother, Paul, who lived in Los Angeles. "I think the donation of his brother's flag is a very wonderful, kind gesture," said Bryant's mother. Bryant's funeral services, with military and LAPD honors, were conducted at Utter-McKinley Mortuary on Vermont Avenue. 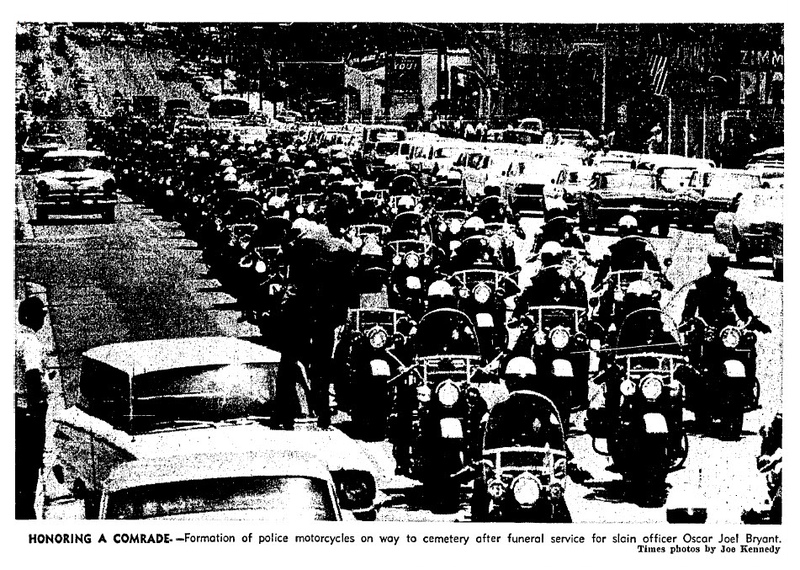 More than 1,000 police officers from around California and across the country attended the services, and 150 motorcycle officers led a procession of more than 200 police cars to Forest Lawn Hollywood Hills for Bryant's burial -- the largest turnout of officers in Los Angeles since the funeral services for LAPD Chief William Parker in July 1966. Among the attendees were LAPD Chief Thomas Reddin; Nancy Warren, widow of LAPD Officer Roger Warren Jr., who was killed in the line of duty in 1967; and Beverly Du Puis, widow of LAPD Officer Keith Du Puis, who was killed in the line of duty in 1966. 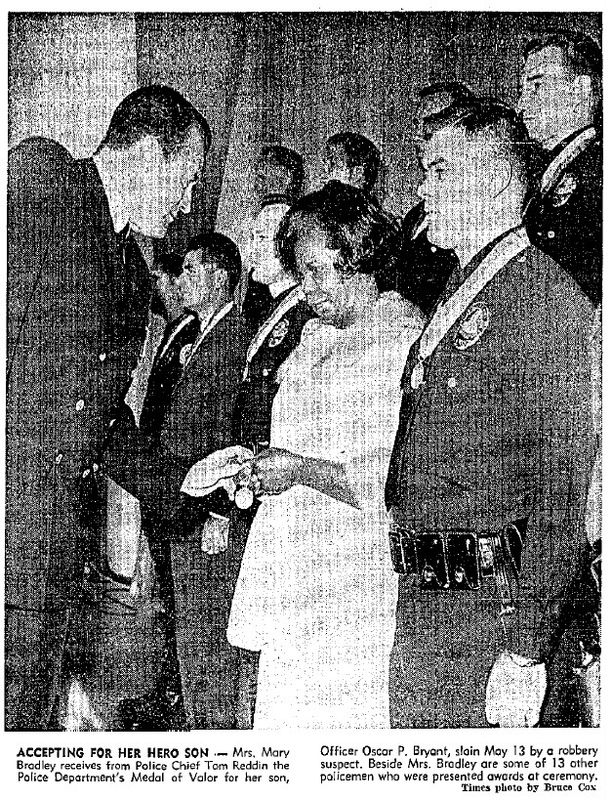 In September 1968, Bryant was one of 14 LAPD officers awarded the Medal of Valor, the department's highest honor. Bryant's mother accepted the award for her son. "I am proud," she said at the award ceremony. "I accept the fact that this was his chosen profession. But it is still difficult to accept." Bryant was the first African-American officer to be awarded the department's Medal of Valor. 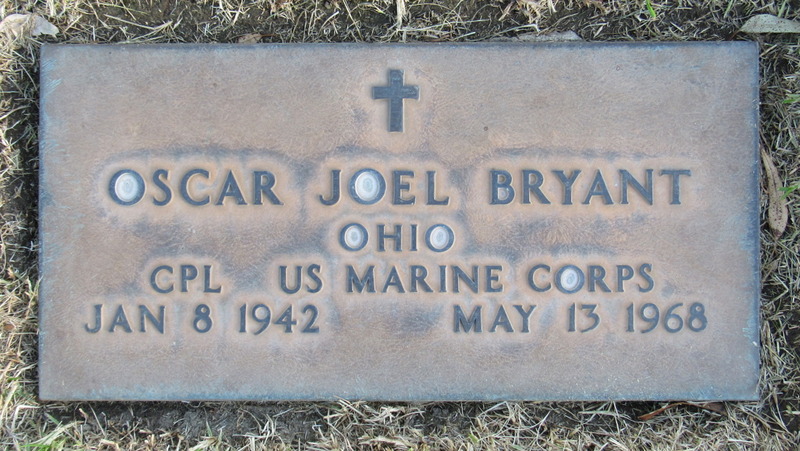 At the time of Bryant's death, it was thought that he was the department's first African-American officer to be killed in the line of duty. That distinction belongs to Officer Charles Perry "C.P." Williams Sr., who was shot and killed on Jan. 13, 1923. Due to a clerical error, a photograph of another officer with the same name -- a white officer -- was attached to Williams' official record in the LAPD's archives. The error wasn't discovered until the late 1990s. A few months after Bryant's death, a group of African-American LAPD officers met to discuss the challenges of racism and discrimination they face, and to work toward identifying solutions. That meeting resulted in the establishment of the Oscar Joel Bryant Foundation, which represents African-American officers and civilian employees of the LAPD and other law enforcement agencies across the country. The foundation advocates for fair treatment in the workplace, protects officers against discrimination and disparaging work environments, assists members in positioning themselves for promotions and career vitality, connects officers to resources that promote financial security now through retirement, provides scholarships to members' children, and offers pre-paid legal counsel.